Lolabuland » Love my on-line classes! I know I said it before, but I really love my on line classes 🙂 - Sooo reinforcing to see all the progress students do in just 12 weeks! And of course, Running Contacts class is starting soon too - you can register here. I know, I don’t know how you manage to do such an awesome job of everything you do! :)…….but some day I would really like to come back to Slovenia. We had such a great time!!!!!! I agree, we do need to do it again one day!!! Yay for more classes!! !, Since you are too far for camp anyway!!!! I need to try to set a record for number of classes!!! What a great job especially with Wilson !!!!! Congratulation!!!!! When I watch the video I think about my own Border Collie! I have the same problem with him!!!! I tried 2 trials in October 2015 and he was very distracted: He said hello to other people and dogs, he run away all the time and I couldn’t finisch my last jumping!!!! I will certainly buy your DVDs for Christmas. I hope it will be better in 2016. Yes, I think Foundation Fun an Ready-Steady-GO! can really help him see how much fun agility is -- so much more fun as other dogs and people! My parents bought Foundation Fun for Christmas!!! And they are going to buy Ready Steady Go!!!! 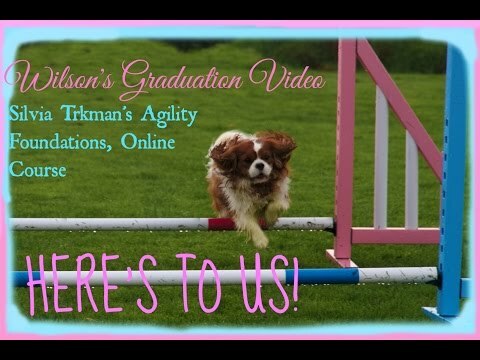 I often read and watch your articles to learn more about agility training. That’s great! I’m sure it will be much easier to keep him focused then! I haven’t Foundation Fun yet but I hope it will come before the end of the year :). I have a tunnel and three jumps and I encourage my dog to run very fast with a ball or a Frisbee and I don’t care if he doesn’t do what I tell him. I reward him just because he jumps, he goes through the tunnel, he runs with me…But he is tired after 2 minutes! Is that normal? I think my sessions will be shorter and very very fun ( I don’t now if Bimka really likes agility)! Yes, that’s normal. Agility course is only 30s long, so no need to train longer as that -- give him a break after every minute of working.